Okay! Okay! Look what I found today! Yeeehaw! What? Whaddaya mean what is it? 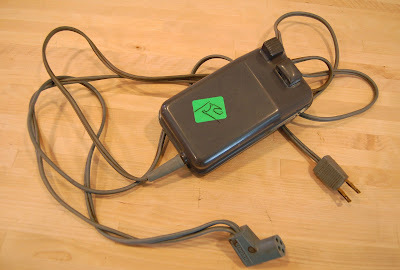 Oh...well friends, this is the EXACT electric cord/foot control pedal that I needed to get my Singer "Rocketeer" 500A Slant-o-matic running! I found this machine 7 years ago at a junk shop in a beat-up old cabinet. There was no cord, case, or manual with the machine, just a few bobbins and odd parts. I never saw a machine like it before and knew that I had to have it! Although there are online sellers offering spare parts, I didn't want to pay the extraordinary high prices. So I waited. And waited. And my patience paid off - did you see how much I paid for the cord? One dollar and fifty cents. SWEET! 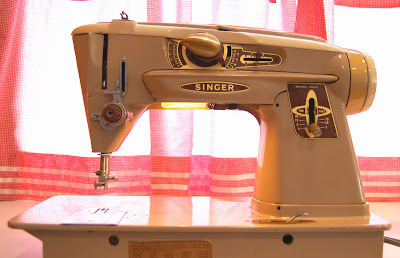 The Slant-O-Matics 500A's were manufactured in the late 50's and early 60's and were the top of the line, considered the "Cadillac" of sewing machines back in the day. Built with all the features of a modern machine (zig-zag and decorative stitches with the ability to add other stitches with extra pattern discs) but still manufactured before companies employed planned obsolescence. This machine features a direct drive gear (no belts to break or replace) and ALL METAL PARTS both inside and out. No wonder it's such a hot item with collectors, it has great functionality and was built to last. I just cleaned up the cord, which is in perfect condition, and am getting ready to start sewing with the Rocketeer. What a great find that machine is totally adorable. It's true that good things come to those who wait. ...wow...what a find!! I recognize the sales tag from the Salvation army thrift store.....right? Yep Karen, Salvation Army! My favorite treasure hunting store.